This release adds Traffic and Glance Mode to Synthetic Vision, new Day/Night app themes with auto-transition, organized track system depictions, and more. Synthetic Vision is enhanced with ADS-B traffic targets* and a new interactive Glance Mode. Swipe within the Synthetic Vision window to activate Glance Mode and experience a zoomable 360-degree view of the terrain, obstacles, airport runway configurations, and traffic around your aircraft. Synthetic Vision is available with a Pro Plus subscription plan or higher, and as an add-on for business accounts. *Traffic requires a compatible ADS-B receiver. Customizing ForeFlight themes and color inversion settings is now a lot easier. The new theme manager provides you with convenient centralized control over all of the individual theme and color settings throughout the app. 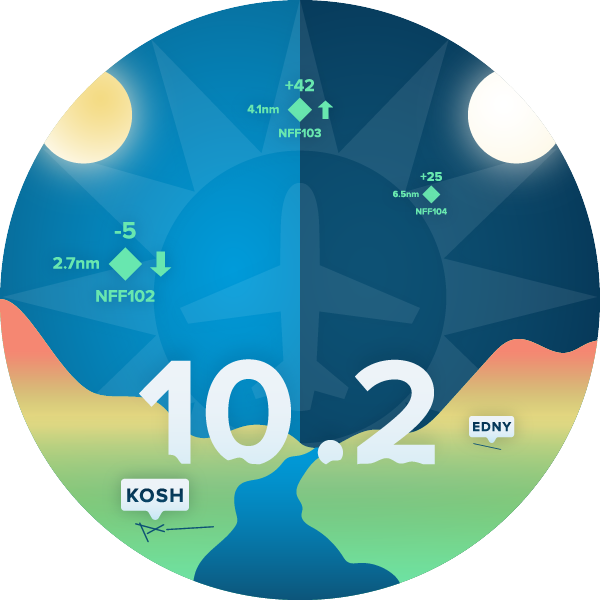 Select from Day, Night or with Auto mode, ForeFlight will automatically transition between the Day and Night themes at sunrise and sunset, helping your eyes adjust to changing light levels with no app interaction needed. 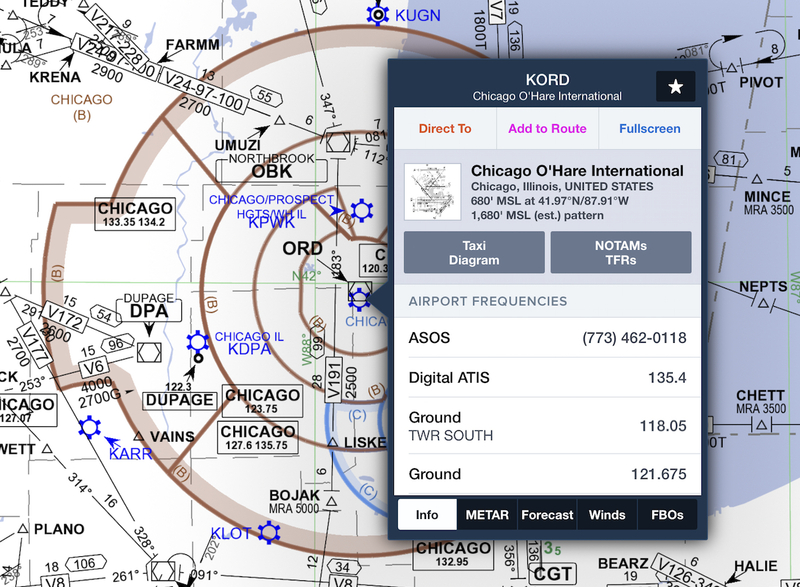 ForeFlight Military Flight Bag (MFB) pilots can now access Bullseye, a powerful feature for measuring distances and directions from an arbitrary point on the map. Bullseye is specifically designed to enhance mission planning and tactical decision-making by providing a secure frame of reference that can be shared among many pilots. Customers planning oceanic flights can now view organized track systems published daily for the North Atlantic, North Pacific, and Australasia regions directly in ForeFlight. The tracks are color coded based on direction and have labels showing each track’s name and component waypoints. Tap on each track to see valid times and controller notes. Organized Tracks are available with Performance Plus or Business Performance subscription plans. Offers inflight weather and traffic on ForeFlight, AHRS, internal WAAS GPS, longer battery life, onboard storage for weather replay, and a CO sensor and alarm system for added safety. Retailing at $499, Sentry is available for purchase now on Amazon. Like ForeFlight’s data-driven Aeronautical map, Jeppesen’s global enroute charts in ForeFlight now support the single-tap gesture on visible map elements. Tap on airports, waypoints, navaids, airways, and more to quickly view information about them and add them to your route. Jeppesen’s global enroute charts are automatically included with any Jeppesen IFR chart coverage purchased through ForeFlight or linked from an existing account. ForeFlight Logbook now supports currency tracking for jet pilots based on the requirements outlined in FAR 61.58. You can add your initial endorsement in the Qualifications section, then track and update your 12 and 24 month proficiency in one or more aircraft types using Logbook entry flight tags. ForeFlight Logbook is available with all Plus plans. 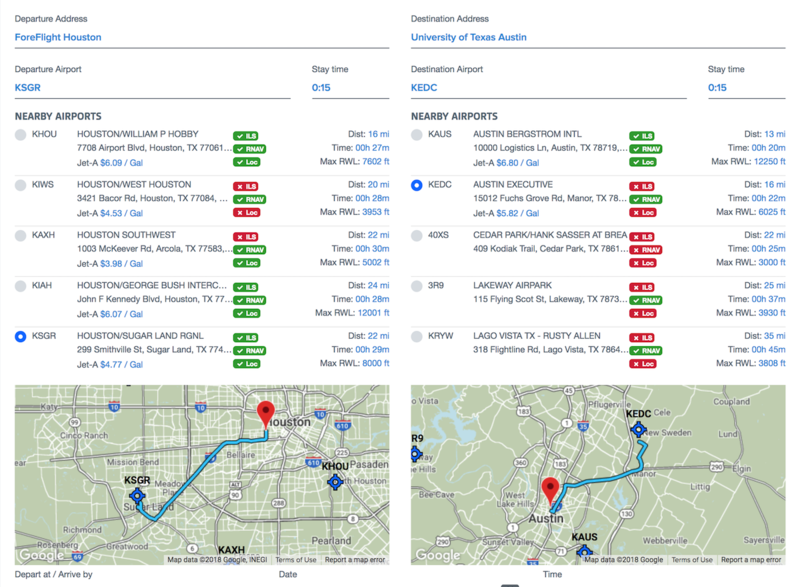 ForeFlight’s web-based Trip Assistant feature for easy door-to-door planning now has dual maps showing the proposed driving routes to and from each airport, providing more insight into the trip ahead. Trip Assistant is available with Performance Plus and Business Performance subscription plans. You can now enter multiple comma separated email addresses into the Email field at the bottom of the filing form to send flight plan information and updates from ATC, like expected route notifications, to fellow pilots or crew members. ForeFlight now sends SMS text messages in addition to emails and push notifications to provide updates regarding your flight plan, such as ATC rejections and flight delay notices, slot allocation messages, and overdue VFR flight plan reminders. Use the new INFO button on Flights to view detailed information about your departure, destination, and alternate airports. Tap-hold on the FILED and EXPECTED route strings in the flight plan filing form to copy them to your device’s clipboard and share them with others.